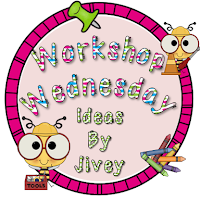 Hope you're having a wonderful Wednesday...time to link up with my sweet BBB Jivey for her Workshop Wednesday! My students started on Monday and we wasted no time diving into reading! Before I start independent reading, I talk about expectations with my students. I ask them, "What kind of expectations do you have as readers in our classroom during independent reading? What do you want our classroom to look like? Sound like? What do you think I expect?" After our first day of independent reading (15 minutes), I knew we had to talk about what "real" reading looks like. More importantly, I wanted my students to know that I know what "fake" reading looks like! LOL! Here is the anchor chart we made today before we read. The great thing about this mini lesson? They know I know all their tricks!!! Great discussions and perfect time to discuss my expectations for independent reading. Does your school have independent reading built in your school day? Go check out Jivey's post and link ups for other great ideas! I make a commitment to DEAR time for at least 30 minutes a day. This is non-negotiable time. After reading The Book Whisperer, my team really made a commitment to this time and it paid off well for everyone! I'm with Lisa - I am totally copying that lesson, too! First, I've got to get my babies to choose their independent reading books tomorrow, then I'll teach them I know all the tricks! Love it! We begin each of our ELA blocks with independent reading. Thank you for this post, it is right on time. We just began our independent reading today. Tomorrow we will be discussing expectations and creating anchor charts; thanks to your post. We are still talking about how I know they aren't really reading! :-P It's so funny how they think I won't catch them. But we're up to 19 minutes of REAL reading now!! YAY! What a great post! I always have those few students who think they can pull one over on me!! I love the real vs. fake reading! Great anchor chart idea!